Well done to all who entered, it has been a very difficult year for growing dahlias. Congratulations to the winners who all receive a one year membership of the National Dahlia Society. All the entries can be seen in the photos below. How do I grow and show a Dahlia? I want to grow one but I have heard they always get covered in earwigs. If so, then now is your chance! Take part in the MDS 50th anniversary: 'grow and show a Dahlia' competition'. Enter the competition and receive your free Dahlia plant. At the end of May 2008 you plant it in your garden. You should get some flowers during August and September. On competition day you bring your best bloom and it is judged along with the other entries. Prizes are awarded for the best three blooms! There about 30 entries to the competition. 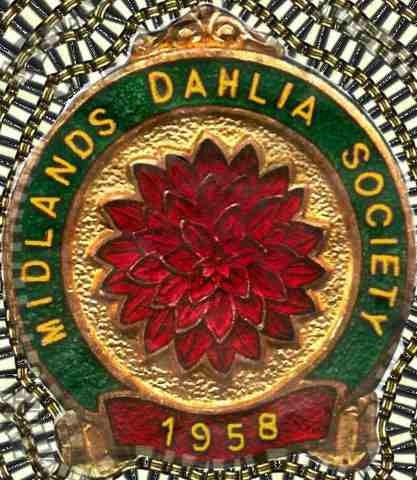 Good news to motivate you further - the National Dahlia Society, NDS, has sponsored 4 free memberships for next year ( worth £15 ) each) to the 1st four places in the competition. This is in addition to the prize money. Help - I need some advice! The easiest way is to e-mail your question via the web site co-ordinator who will get an answer to you. So, you have entered the competition, well done. This section will provide advice and information on what to do next. It will be updated to keep you on track. I've got the plant what next? put them on a window sill or greenhouses and give them a bit of water. You need too keep them moist until they are planted out at the end of May. Preparing the bed in the garden. For an individual plant you need to select a sunny part of the garden. The plant will grow to 4 ft tall and will need an area of about 2ft square. Putting on some bone meal or 'blood hoof and horn' ( about 1oz) will put some Nitrogen into the soil. Slugs like Dahlia plants so you will need to put slug pellets out. Putting them out prior to plating will reduce the slug population and better protect the plant when put out at the end of May. Planting out Dahlias do not like frost, so we usually plant out at the end of May. Put a stake in the centre of your 'plot' and then dig a hole next to the stake just a bit deeper than the pot the plant is in. Water the plant thoroughly and then take out the plant and put it in the hole. Fill in around the plant with the soil and water again. Finally tie the main stem of the plant loosely to the stake with a bit of string. No stand back, take a photo and pat yourself on the back. Keep the slugs at bay with pellets. Look at the 'how to' photos - these should help! June: Early days - what happens now? If there is a risk of frost then protect the plant by covering with a bucket ( remove it in the morning!). As the plant starts to grow, add three more stakes around the plant. These will support the side shoots and flowers of the plant. Again do not tie the side shoots too tight when they are large enough. In mid June the centre shoot will need to be pinched out at the top, above the third pair of leaves ( this is called stopping), and encourage side shoots to grow. Look at the 'how to photos - June' to see how to do it. It is not really necessary to water the plant during June, unless it is really hot weather - just make sure that the plant remains moist. July: growing strong now, make sure that the plant shoots are adequately tied to the stakes. This will ensure that any wind will not break the stems. When the side shoots have grown with at least one pair of leaves, they need to be stopped again ( this is double stopping). This should now mean that there are 6 main shoots on the plant. Look at the how to photos - July. Water as necessary, Dahlias require a lot of water, so if it is hot, they will need a drink. August - first flowers should now be appearing on the six shoots. You should see three flower buds per shoot. Before the two side buds get very large, pinch them out. This will encourage the main bud to grow - this is what we are looking to show. Some plant food can be given to the plant, for example growmore. Showing - come to our annual show at Kenilworth school on 23rd, 24th August and see what's involved, ask questions of the members, have an afternoon out! September - counting the days to the show - you should have four or five good flowers. 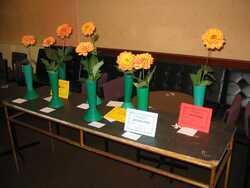 The show is on the 14th, you will need to cut the two best flowers on the morning of the show, keep them in water. Come to the Kenilworth Sports and Social Club between 9.00am and 11.00am. 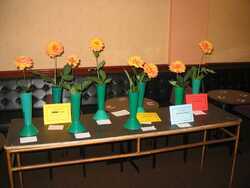 A Vase will be provided for you to 'stage' your best flower in the competition. You will need some newspaper to mount the stem into the vase. Judging starts at 11.00am. Come back after 12.00 and see how you got on! Job done. October - thinking about next year! If you enjoyed the experience, then you should be thinking about what to show next year. Come to the society meetings and discuss ideas with the members.